A line of women’s ultrathin watches was created in 2011, to celebrate the 80th anniversary of the cult collection Grande Reverso. Opening with a tipping body, designed for players of polo, have stood the test of time and became one of the most popular in the range of Jaeger-LeCoultre. In the model presented in the exhibition kept the proportions and unusual design of the case, the shape of arrows and numbers. Watch case is made from a combination of 18K rose gold and stainless steel. The model is assembled on the basis of high quality quartz mechanism. The watch comes with a leather strap (Ref. Q3204422, Ref. Q3204420) or a combination bracelet (Ref.Q3204120). 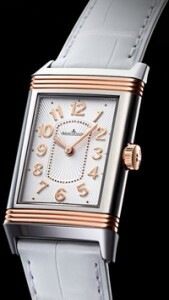 Buy watches Grande Reverso Lady Ultra Thin can be in stores Jaeger-LeCoultre.